Looking for a gift or something special for yourself then see the wide range of items on sale at The Breast Cancer Site's Pink Ribbon Sale. One such item that caught my eye is the cozy custom-designed hooded fleece jacket shown here and on sale at $21.95! 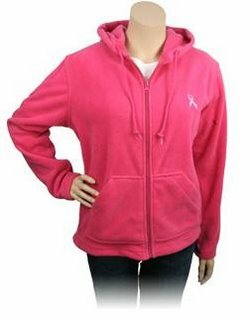 Custom-made for The Breast Cancer Site, the jacket features a full-length, heavy-duty front zipper and two front pockets. Bottom hem and cuffs are double-stitched for extra durability. The Breast Cancer Site will fund 1.0% of a mammogram for each Pink Ribbon Fleece Hooded Jacket purchased.